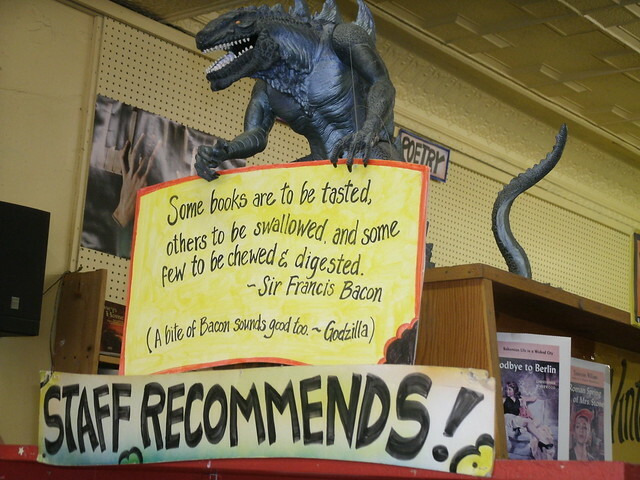 Congratulations to Simon Ayesse, a friend of the store who suggested we use Sir Francis Bacon’s quote “Some books are to be tasted, others to be swallowed, and some few to be chewed and digested,” to go along with our new book Godzilla monster. We think the quote goes great on top of our shelf of “Staff recommendations.” After all, those are our finest cuts of book. We decided to name the monster Francis after the famous English scientist and philosopher who gave us that lovely quote. Fun fact: Sir Bacon died from pneumonia contracted in the cold while studying the effects of freezing on the preservation of meat. We also wanted to thank Bryan McRea for giving us the Godzilla figure. We think he makes an opposing presence in our store. Thanks for all of your suggestions on Twitter and through e-mail. And feel free to come by and say hello to our godzillas in person if you can. This entry was posted in Uncategorized and tagged customer contest., Francis Bacon, Godzilla, Monster, staff recomends. Bookmark the permalink.